Posted byPaula Turner	 July 4, 2013 July 5, 2013 10 Comments on Coming home…. This photo of my daughter and her boyfriend says it all – summer time is here. I have been away from blogging for several months. Lots of reasons, no excuses. I was declared excess at my school and had to find a new position for next year. Due to seniority, I would have been placed at a school had I not been successful in finding something on my own. Yet, I wanted to have some semblance of control in a situation that was somewhat uncontrollable. I went on a total of 8 interviews and had 4 offers, which was a true luxury. That process took several weeks to accomplish. I also was very intensely training for a long distance ride. 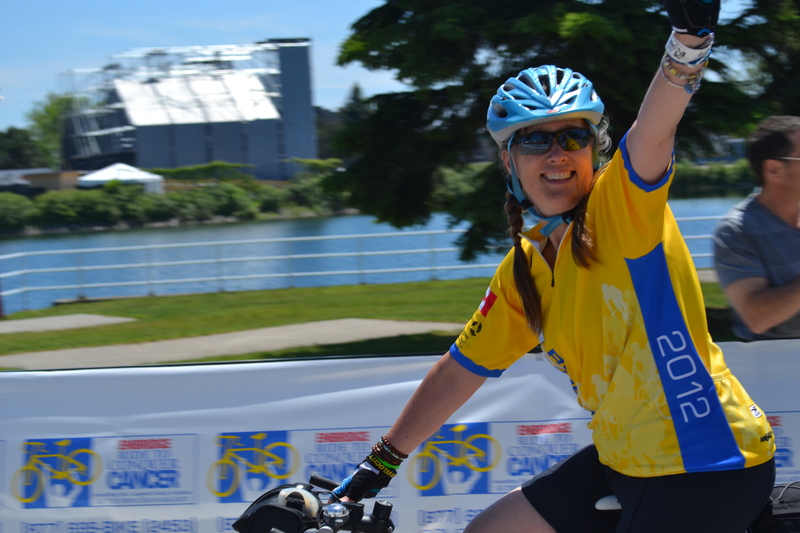 I participated in the Ride to Conquer Cancer which takes place over two days, covering 200 km. I loved the feeling of accomplishment, not just as I crossed the finish line, but as I got to the top of each of the MANY hills. I was so touched by the support of my donors, as we collectively fundraised over $3200. The finish line – wearing my hubby’s shirt from his 2012 ride. Another big time issue for me was putting together the yearbook at my present school, the school I have had to leave. This was a great deal of work, but so worth it. Yet, it was hard to do because it just made me realize, again and again, how much I love my little community school. The school is a few blocks from home – it was my children’s school and therefore I have been going into that building on and off for 19 years. There is something undefinable about the school – perhaps it’s just that I feel so comfortable there, like going to work is like coming home every day. I will miss being there and the amazing people I was so lucky to work with for the past several years. And finally, I was busy planning a surprise for my sweetie. 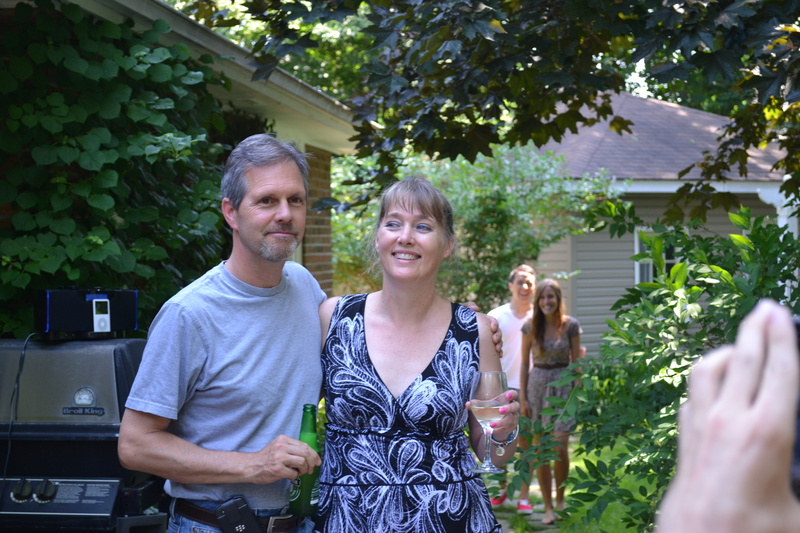 We celebrated our 30th anniversary in May, but I wanted to surprise him with a party all about him. Our daughter goes to school in B.C. and was attending summer school this year, so I had to wait until late June to have the party. And bringing her home was another layer of the surprise. It was really hard to keep the secret of her homecoming, along with hiding all the party items and ensuring people kept the secret. It almost all fell apart a few days before the actual event when my hubby announced he was not going to go away for a few days – the few days leading up to the party, when I was going to get everything in place and my daughter was going to arrive. In the end, he went away and the party went off without a hitch. The first part of the surprise was the party, the second part was when my daughter and her boyfriend snuck up and surprised him! Now, summer is here and taking photos should again be happening. Glad to be back. HI Paula – nice to see you back! That is a terrific shot of your daughter. I hope you settle in to your new job quickly and find it enjoyable! Thanks – good to be back! Hello (sorry if my comment is repeated) I came across your picture of your daughter and her b-boy in the reader and thought it was fantastic! simple, true and happy. Your pictures (I’ve only gotten so far) are magnificent ! I don’t usually do people shots but my daughter, her bf and my sin male great subjects! Thanks! It’s good to be back…. such a happy energy in this visual feasting…yay YOU!